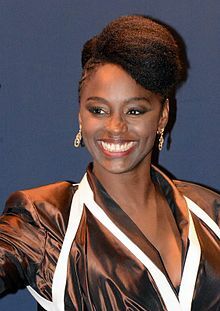 Aïssa Maïga is a Senegalese born French actress. She graduated from high school after three years of study, including theater studies and worked on an artistic project in Zimbabwe, Eric Cloué’s Le royaume du passage. She was 19 years old. Working with local actors in Zimbabwe, she discovered street theater and decided to become an actress. She made her feature film debut, appearing in Denis Amart's Saraka Bô. She followed that up in 2000 playing a rebellious young girl in Hanake's Code Inconnu, starring Juliette Binoche. Aïssa Maïga has developed her versatility by taking on such a great diversity of roles. In 1999, she worked with New Wave director, Alain Tanner, in the sequel to the 1975 cult film Jonas, playing Lila in Jonas and Lila. In Alexandre Jardin's 2001 comedy, Le Prof, she worked with Jean-Hughes Anglade, playing a student. Then she worked with Murielle Robin and Fejira Deliba in Marylin, a film dealing with the social and economic insecurity and solidarity among cashiers. She collaborated once again with Haneke in Caché (2005), playing with Juliette Binoche, Daniel Auteuil and Denis Podalydès. She also appeared in several television series. In her desire to consolidate all she had learned, she returned to her studies, this time with Hélène Cheruy Zidi, at the Actor’s Lab. Her perfectionism was well worth the effort. In 2007 she starred in two features, distinguishing herself in the role of Kassia in Kapiche’s Poupés Russes and in Claude Berry’s L’un reste,l’autre part. Aïssa Maïga made her mark on French cinema through a series of roles and fortuitous meetings with films such as Je vais bien, ne t’en fais pas with Melanie Laurent and in Oliver Schmitz’s short "Place des Fetes" in 2006's Paris, je t’aime. In 2007 she was nominated for a Best Actress César for her role as Melé, a disillusioned bar singer in Abderrahamane Sissako’s Bamako. In this role she sang Christie Azuma’s “Naam” without knowing the language. Although she had numerous film successes (Michel Gondry’s L’Ecume des jours, art films and comedies, i.e. Prête à tout, TV films such as Toussaint L’Ouverture, 2012), her popularity was not an obstacle to a return to the stage in Brooklyn Boy (2004), Les grandes personnes, adapted from the book by Marie N’diaye as well as in David Lindsay-Abaire’s Des gens biens. She plays an African mother who tells the story of African intellectuals’ immigration through the lens of the life of French rapper, Kamini and his family in the 2016 movie Bienvenue à Marly-Gomont. In 2012, she appeared in Cristina Comencini’s Bianco e Nero with Thierry Ebouaney, a performance that won her two awards: Cinema i Done and the Festival de Bastia award. She was also on the set of Mickey Dubé’s Comatose in South Africa in 2016. In 2018 Aïssa appeared in the Irish RTE drama "Taken Down" written by Stuart Carolan, playing a main role to critical acclaim. For several years, she has been the ambassador of AMREF, an African NGO dedicated to training medical personnel involved in caring for mothers and children. In 2012, she went to Uganda on a humanitarian mission. Wikimedia Commons has media related to Aïssa Maïga. This page was last edited on 17 January 2019, at 13:15 (UTC).